The Young Irelander’s Rebellion of 1848 could be described as the ‘Cinderella period’ of Irish Republicanism – the forgotten neglected sister who stays at home whilst all the others get go to the ball. It is probably the least well-known, least studied and least romanticized of all the republican rebellions between 1798 and 1916. This is probably because its ‘martyrs’ were exiled and not executed by the British authorities in Ireland and because the rebels of 1848 scored no great military victory over the British forces in Ireland that could be commemorated in popular song and story. In his book, The Young Ireland Rebellion And Limerick, Laurence Fenton has to be complimented for shining a spotlight on this often neglected period and for having produced a well written, modern and ‘popular’ history of not only of the 1848 rebellion but of the whole Young Irelander movement from 1842 to 1848, its origins, its leadership and its legacy. The author begins his narrative at a meeting of Daniel O’Connell’s Repeal Association in Dublin in 1846 – he assumes a basic knowledge of the time period but not to such an extent that it will leave the reader feeling lost. Fenton immediately sets the scene and through his writing gives the reader a real sense of the tension and bitter infighting that occurred during the power struggle within the movement at that time. Fenton introduces us to the, at times vicious, debate between the followers of Daniel O’Connell who sought to repudiate physical force “in any event and in any contingency” and the leaders of the more radical “Young Ireland” faction who though not avowed militants, refused to rule out the possible use of force to secure a level of Irish Independence. The author explains clearly the origins of the ‘Young Ireland’ movement, the reasons for its break with the Repeal Association at the time of O’Connell’s death and its open attempts to rally the Irish people to rebellion in the midst of the famine through public meetings, speeches and rallies rather than underground conspiracies and clandestine manoeuvres. The main event of the rebellion, happened when a few hundred rebels armed with pikes, farm implements and no more than twenty-two guns with little ammunition attacked a group of Irish Constabulary at Ballingarry on the 29th of July 1848. This event is too often dismissed derisively as “the battle of widow Mc Cormacks Cabbage Patch” an oversimplification of the event which seems to have rankled with the rebels themselves in later years. Fenton tells us that in 1862, one of the leaders of the rebellion William Smith O’Brien challenged Robert Peel, the son of a British Prime Minister, to a duel after he made a jibe about “cabbage garden heroes”. William Smith O’Brien challenged Robert Peel, to a duel after he made a jibe about “cabbage garden heroes”. The author puts this event in the context of the events in Ireland that summer when there was widespread unrest throughout Munster and parts Leinster, and the British authorities in Ireland government was unnerved at the frequent reports of rebel forces marching and drilling in the hills. Fenton’s book provides a very good analysis of the strategic thinking and military mindset of the Young Irelanders. Thomas Francis Meagher one of the rebels chief strategists apparently chose the Tipperary and Kilkenny area to raise the flag of revolt because it was “a thinly garrisoned district”, but failed to realise just how badly organised and armed the rebels there actually were. He also explains how an army of over 4,000 enthusiastic if poorly armed rebels hemorrhage new recruits and evaporated in response to widespread rumour, confusion and clerical opposition. Fenton reminds the reader that the real measure of the movement lies in the motivation of the rebels, their politics and the context of the rebellion in the “springtime of the peoples” as rebellions brought out across Europe the same year – not in one skirmish that has come to symbolise the failed rebellion and the whole Young Ireland movement. Fenton gives a detailed account of rebel activities throughout Munster, and their motivations and plans. The book also recounts the activities of British Government spies in Limerick and clerical opposition to the rebellion a theme that began in 1798 and was to continue with the Catholic Churches condemnation of the Fenians and all later republican movements. The narrative finishes with an account of the various fates including forced exile and imprisonment suffered by the rebel leaders in Australia and America and their subsequent careers and involvement in Irish politics. Fenton also analyses the importance of the Young Ireland movement and the rebellion of 1848 on later republicans including Patrick Pearse, Rodger Casement and the republican rebels of the 1916 rising. One criticism I would have to offer is that the book is badly titled. Although a large part of the books narrative takes part in the Abbeyfeale district on the Limerick – Kerry border and in Limerick City it seems when you are reading the book that an almost equal amount of time is spent narrating and discussing events in the rest of Munster and in the midlands. 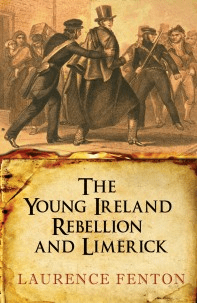 Since the book gives a complete account of the Young Ireland movement from its inception to its destruction and of the 1848 rebellion right throughout Munster and the midlands the title, The Young Ireland Rebellion and Limerick, seems to imply that the book is a local history when in fact it casts a much wider net and gives the reader much more information on the period than a local history would. The title implies that the book is a local history but it casts a much wider net and gives the reader much more information on the period than a local history would. Overall the book is clear and well written, the author has a talent for creating an appropriate mood for the narrative in his writing and he makes brilliant use of contemporary newspaper accounts and sources. I can recommend the book to anyone who has a strong interest in Irish history, a specific interest in the famine, Daniel O Connell, nineteenth century Ireland or anyone who wants to make an in-depth study of the politics and history of militant Irish Republicanism. Written by: PadraigOgORuairc on 12 October, 2010. Last revised by: Eoinpurcell1 November, 2010.